My focus does not lie only in the correction of the vision defects. In my case there is more than meets the eye: your complete wellbeing is important to me. Your eyes are your window to your health. They tell much about your wellbeing. Because of that it is recommended to annually check these important audiograms, because no other organ in your body shows the condition of your arteries and veins more accurately. 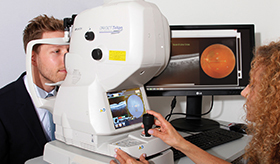 Your eyes will reveal any anomalies to the eye doctor, which could impair your vision. Even if you have good eye sight and no eye problems, please have your eyes checked at least once a year. The eye medicine (medical term: ophthalmology) is the discipline about the illness of the visual organ and the sense of sight. 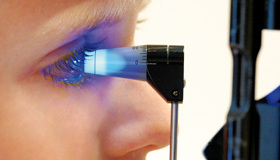 Eye doctor is the professional title of doctors who deal with ophthalmology. Ophthalmology is one of the oldest medical professions. The anatomical boundaries of ophthalmology form in the front the eyelid skin and face skin and at the back the bones and eye socket. With the examination capabilities of the central visual pathway and the visual cortex, they reach furthermore to the backside of the skull. Close relationships exist between the ENT medicine, dermatology and neurology. 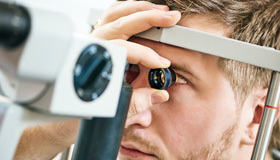 Because the eye is often involved in general illnesses, and because it is possible to carry out examinations on live tissue, ophthalmologic findings are often used in the diagnosis of internal medicine. 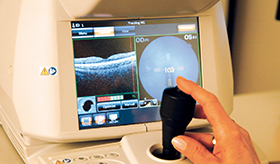 Modern ophthalmologic examinations require extensive and costly technical equipment.